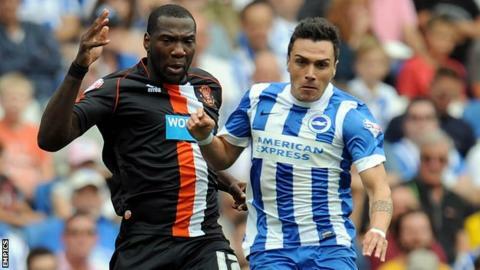 Blackpool picked up just their second point of the season after holding Brighton to a draw at the Amex Stadium. The Seagulls, now without a win in four league games, found visiting goalkeeper Joe Lewis in excellent form as he pulled off a string of important saves. Brighton striker Adrian Colunga went through one-on-one with Lewis in the opening minute but scuffed his shot. Lewis denied Danny Holla twice after the break, while Ishmael Miller tested Albion keeper David Stockdale. Blackpool had lost seven of their first eight games in all competitions this season, marking their worst start to a campaign in the club's history. However, Jose Riga's side put in a backs-to-the-wall performance in Sussex to grind out a goalless draw. Lewis, after denying Colunga early on, saved low down from on-loan midfielder Joao Teixeira and then kept out an angled shot from the Portuguese playmaker. Blackpool forced their first attempt on goal in the 27th minute when a low shot by Polish midfielder Tomasz Cywka was well held by former Fulham keeper Stockdale. Joe Bennett sent a sweet left-foot free-kick into the side-netting as the home side finished the first half on top. Lewis again excelled himself after the break, keeping out a fierce shot from Holla and then pulling off a flying save to palm away a free-kick by the Dutchman. Blackpool had a rare chance as the game opened up and Miller's shot forced a smart save from Stockdale. The Tangerines, having used all their substitutes, had to see out the remaining six minutes and a further six of stoppage time with 10 men after Jeffrey Rentmeister suffered an ankle injury and had to be helped off. Brighton boss Sami Hyypia: "I'm an ambitious guy and I'm not happy we didn't win this game. But there are no easy games. "I take the responsibility now and I'm not happy with the way we played or the result. Every game is so important and every point counts to the tally." Blackpool boss Jose Riga on speculation over his future: "I prefer to be focused on the job and I'm very comfortable with what I've done since day one. "I'm focused on my team, the staff and certainly the fans and I'm trying to do whatever to help us." Match ends, Brighton and Hove Albion 0, Blackpool 0. Second Half ends, Brighton and Hove Albion 0, Blackpool 0. Attempt saved. Paddy McCourt (Brighton and Hove Albion) right footed shot from outside the box is saved in the bottom left corner. Assisted by Joe Bennett. Corner, Brighton and Hove Albion. Conceded by Tony McMahon. Attempt blocked. Kazenga Lua Lua (Brighton and Hove Albion) right footed shot from outside the box is blocked. Assisted by Joe Bennett. Attempt missed. Paddy McCourt (Brighton and Hove Albion) header from the centre of the box misses to the right following a corner. Corner, Brighton and Hove Albion. Conceded by Sergei Zenjov. Francois Zoko (Blackpool) is shown the yellow card. Corner, Brighton and Hove Albion. Conceded by Francois Zoko. Attempt blocked. Craig Mackail-Smith (Brighton and Hove Albion) left footed shot from the centre of the box is blocked. Assisted by Gordon Greer with a headed pass. Attempt blocked. Danny Holla (Brighton and Hove Albion) right footed shot from outside the box is blocked. Corner, Brighton and Hove Albion. Conceded by Nile Ranger. Attempt missed. Kazenga Lua Lua (Brighton and Hove Albion) right footed shot from outside the box is just a bit too high. Assisted by Lewis Dunk. Jeffrey Rentmeister went off injured after Blackpool had used all subs. Delay in match Jeffrey Rentmeister (Blackpool) because of an injury. Craig Mackail-Smith (Brighton and Hove Albion) wins a free kick in the attacking half. Dangerous play by Jeffrey Rentmeister (Blackpool). Attempt blocked. Craig Mackail-Smith (Brighton and Hove Albion) right footed shot from the left side of the box is blocked. Assisted by Kazenga Lua Lua. Substitution, Brighton and Hove Albion. Paddy McCourt replaces Sam Baldock. Substitution, Blackpool. Francois Zoko replaces John Lundstram. Attempt missed. Lewis Dunk (Brighton and Hove Albion) header from the centre of the box is too high. Assisted by Kazenga Lua Lua with a cross following a corner. Corner, Brighton and Hove Albion. Conceded by Nathan Delfouneso. Attempt blocked. Lewis Dunk (Brighton and Hove Albion) right footed shot from the centre of the box is blocked. Assisted by Jake Forster-Caskey with a cross. Joe Lewis (Blackpool) is shown the yellow card. Attempt saved. Ishmael Miller (Blackpool) left footed shot from the centre of the box is saved in the bottom left corner. Ishmael Miller (Blackpool) is shown the yellow card for a bad foul.